Review: Charles and his second wife, Ruth, find that they are haunted by his first wife, Elvira. They get help from Madame Arcati by contacting the ghost. Adapted from a Noel Coward play that had been a major success in Broadway and in London. It is believed that when Noel Coward was first shown the finished product of this he was distinctly unimpressed. He also didn’t approve of the changes that were made. 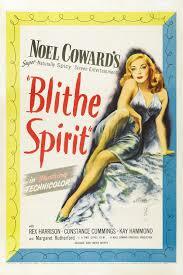 Even though Noel Coward didn’t approve, critics lapped this film up. Nevertheless, it was a box-office failure. Apparently Cary Grant was offered the role of Charles Condomine but turned it down. This film is now regarded as a cult classic. I found this to be genuinely funny but it also drags a bit for modern audiences. At the Academy Awards in 1947 this won an Oscar for Best Effects, Special Effects.